"You don't talk white enough." Rapper turned filmmaker Boots Riley, frontman of the leftist Oakland hip-hop crew The Coup, has made a totally original, absurdist dark sci-fi comedy grounded in elements of magical realism set in the world of telemarketing. 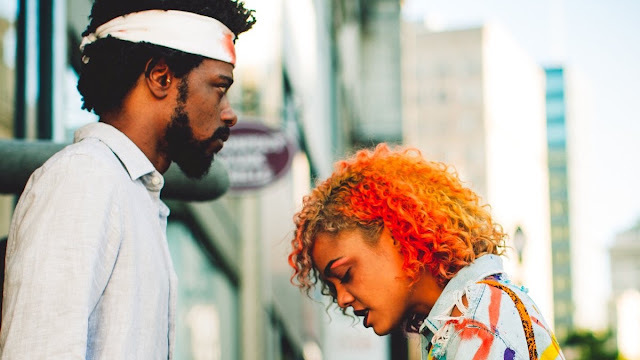 Sorry to Bother You is a boldly batsh*t crazy, sometimes maddening but always ambitious visualization of the exploitative nature of corporate culture. I'll say this for certain, there's absolutely nothing like this film and Riley definitely proves his chops as an exciting new voice in filmmaking. Jarringly, the satirical picture is much more surreal and bizarre experience than you'd expect. Starring the fabulously versatile Lakeith Stanfield as a struggling telemarketer, Cassius "Cash" Green, who adopts a "white voice" (David Cross) to make sales, Sorry skewers American capitalism's ideals through menial entry-level work. Stanfield is a suitably accessible using his voice and physical machinations as metaphors for code-switching and entering a higher-class (and much whiter) business world. Next to him, an incredibly vivacious Tessa Thompson offers a captivating, complementary role as Detroit, Cash's girlfriend, who is an activist conceptual artist. She's never been more appealing or fiery with an undeniable sexiness yet still complementing Stanfield's loser character making Cash and Detroit's relationship feel genuinely heartfelt. A mysterious Steven Yeun gets a nice turn as Squeeze but his somewhat ambiguous character, a union organizer, never gets much of his own motivations outside of a strange monologue about STDs and unclear attraction to Detroit. Yeun does some fine work as a sort of straight man presence around the escalating sheer insanity of the film's unfolding plot. Once Armie Hammer's Steve Lift, the tech-bro dirtbag CEO of a lifetime work camp corporation, enters the picture, Sorry takes a sharp turn to an even more absurdist direction. The darkly satirical comedy tackles even more fantastical elements as Cash discovers the true plot behind the different levels of corporations he works for and his involvement in their duplicity. Riley's commentary on the economics of racism and slavery through labour rights is truly illuminating and confronted head-on. Riley's weirdly colourful and delightfully deranged vision of a vaguely dystopian Oakland is bright and shiny with a suitably menacing underbelly. With shades of Michel Gondry, the fantasy stories, cultural commentary, and literal uprising plot don't quite mesh together as character plot threads are left dangling and the bizarre unfolding machinations start to collapse on top of one another as the characters take action. There are just so many ideas in Riley's film to unpack. Parodies of reality television shows, satirical billboards, and other flourishes make the strange world feel so vivid. Yet somehow, the characters aren't quite as sharp. From Cash's best friend played by Jermaine Fowler to Yeun's Squeeze, and Kate Berlant as their team leader, the talented cast doesn't quite get enough to chew on with so much impactful chaos around them. Sorry to Bother You is defiantly what it is. Riley and Stanfield's refreshing work is so appealing and totally out there as elements of black west coast culture confront corporate greed in truly artistic yet off-putting ways. I had no idea what I was watching while I was watching it and I'm stilltrying to grass the parallels between the imaginative visual storytelling with the nightmarishly comic view of the world.